Proceedings at the upper and lower legislative chambers of the National Assembly clearly indicate that members of the Nigerian legislature are hell-bent on sustaining the seeming infractions in the passage of budget, which was the norm prior to the 2016 budget signing. The old and controversial constituency projects, most of which were largely unexecuted or personalized by the legislators against public service rules, appear set to continue. Need not over-stretch the fact that it was the controversy of whether or not members of the National Assembly have the constitutional right to introduce capital projects in the budget proposal by the executive arm that majorly caused delay in President Muhammadu Buhari signing the 2016 budget. The debate of budget padding between members of both arms of government remains fresh in our memory. President Muhammadu Buhari had to return the budget to the National Assembly for the infractions to be corrected and the casualty of the heated controversy is the now suspended member of the House of Representatives, Hon. Abdumumin Jibrin, who was until the questionable suspension, the Chairman, House Committee on Appropriation in the House of Representatives. In as much as President Muhammadu Buhari handled the 2016 budget controversy as a Military General, his Vice and Acting President, Prof. Yemi Osinbajo deployed diplomacy in tackling the 2017 appropraition controversy. The truth must however be told that the signing of the approximately 7.4 trillion naira 2017 budget by Acting President Yemi Osinbajo reportedly on the advice of President Muhammadu Buhari, exactly one month after the National Assembly passed the budget holds more controversy than the 2016 episode, even though Ag. President Osinbajo diplomacy seemingly doused tension. 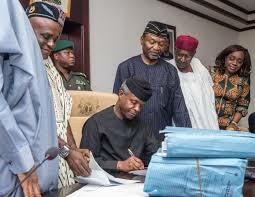 Despite the ceremony that greeted the signing of the 2017 budget by Prof. Osinbajo, the controversy surrounding the apparent unconstitional infusion of over 400 constituency projects into the budget and the cropping out of vital capital budgetary proposals by the executive with a compromise of virement to be sent to the National Assembly by the executive could be the beginning of another long-drawn National debate. The reported agreement of whether or not the executive will implement the over 400 projects included in the budget by the legislators for obvious percuniary interest, is another controversy likely to brew in the days and months ahead. The crux of this piece rest on the fact that despite the signing of the 2017 budget by Acting President Yemi Osinbajo, the surpressed controversy surrounding the budget will come to the fore soonest and subsequently affect its implementation negatively, because what is wrong cannot become right for a government that came to power on the mantra of change.